For centuries, the pomegranate juice is used for therapeutic purposes thanks to its antimicrobial, anti-inflammatory, antitussive, astringent, healing and antidiarrhoeal properties. Among other things, it prevents the oxidation of “bad” cholesterol (LDL), which is a major risk factor for cardiovascular diseases and it also appears to reduce the levels of total and “bad” cholesterol in diabetic patients with hyperlipidemia. It protects against brain damage, it reduces high blood pressure and there is evidence that long-term consumption improves sexual function. It is also considered to contribute to the prevention and slowing down the growth of skin, breast and prostate cancer. It is also used for the treatment of chronic diarrhea, dysentery and for the treatment of osteoarthritis. Finally, it cleans and protects the skin; it is used in the treatment of burns and the herpes virus and reduces wrinkles and ulcers. The juice of fresh pomegranate increases blood production relieves fever and reduces cardiac distress. It is ideal for small children, especially when they have cough and fever. It helps pregnant women with morning sickness and it is especially recommended after strenuous physical exercise. The antioxidant phytochemicals protect our body from the damaging effects of oxidants formed daily by normal cell metabolism. 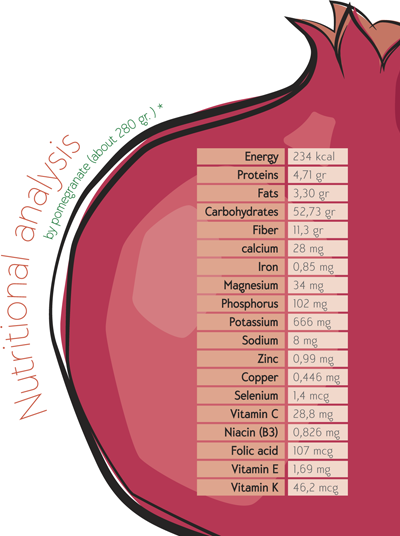 The pomegranate fruit is very low in calories (68 calories in 100 gr. of fruit) and particularly rich in carbohydrates and potassium. 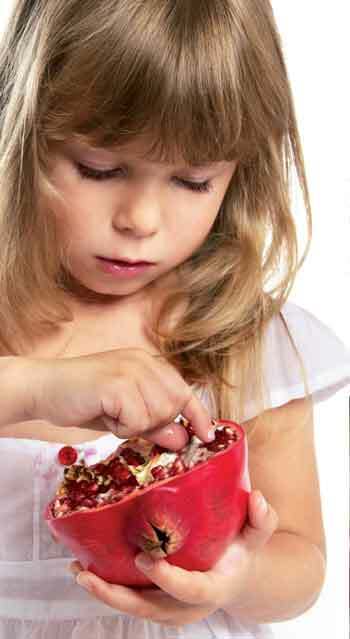 The pomegranate is rich in vitamins (A, C, E), folic acid, iron, potassium and fiber, while being low in calories. It is true that a pomegranate covers 40 % of the amount of vitamin C and 25% of folic acid that an adult needs daily. It is rich in three different forms of antioxidants (tannins, anthocyanins, ellagic acid) and its total antioxidant capacity is calculated to be 3.2 times greater than that of red wine and green tea. In a recent study, it was shown that pomegranate and berries of different varieties have stronger antioxidant action at cellular level, compared to 25 other fruits that were examined. good health, well-being and protection of the skin due to its anti-aging properties.